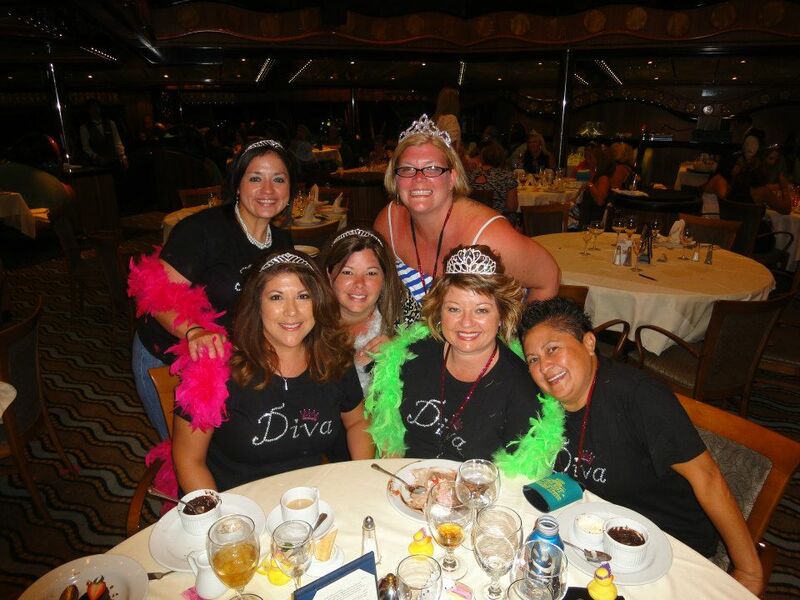 Although the ship wasn't leaving until Thursday, September 20 for this Third Annual Diva Cruise, I had finished my packing a week ahead of time. This has always been my goal for my trips, but in reality, rarely works out that way. I'm usually still throwing things in the night before I have to leave. But this time, it was fortunate that I managed this feat because late Sunday night / Monday morning I was having some chest pain / tightness. It started out as a very noticeable tightness that just got stronger over a twelve-hour period. I had an extreme amount of gas with frequent belching, but didn't think gas should last that long. This had kind of happened about 6 weeks ago, but the tightness was less then. And now days we are always hearing about how the symptoms of heart attack for women are different than for men. So, I finally decided to drive myself to Mansfield Methodist hospital (didn't want to wait until cruise day to go check it out! ), stopping to get cash for my cruise on the way. Besides, I'd met my deductible this year. Once the Monday morning EKG showed no heart problems, I wasn't very concerned the rest of the time while waiting for blood test results. I was checked into a large private room. They kept me over night and did a stress test on Tuesday . Basically they just ruled out any heart problems but said there are a number of causes for chest pain, including esophageal spasms and reflux. I got a prescription for Nexium. The problem is that it's not happening all the time. And, no, it wasn't a panic attack. 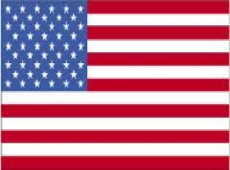 So I got out of the hospital Tuesday around 6:00 PM with plans for meeting three friends to drive south to Galveston Wednesday morning around 9:30. There was a second car of four more Divas driving from the Dallas / Ft. Worth area who would get a bit of a later start than us. 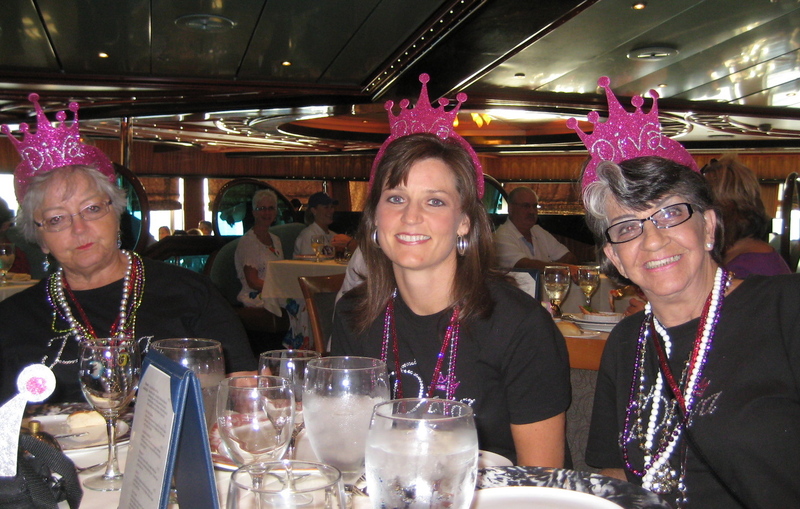 I'm not quite as crazy as the rest of the bunch of Divas on this cruise, but it's always fun. 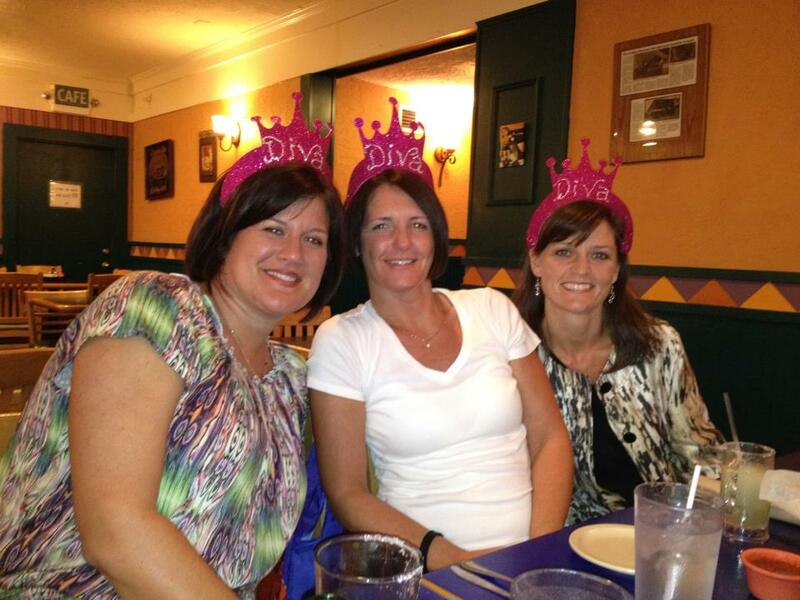 This is our third year for the Diva group. I just wish we had a few more destinations for short cruises out of Galveston so we could have more variety of shore tours. So, Wednesday morning Katie, Lisa, and Cynthia pulled into my driveway. We managed to load four of us in my Mercury Grand Marquis along with all our luggage and carry on bags. This was no small feat since I have never been known to pack lightly. Then we were off, all the way to Schlotzky's sandwich shop to get a Cinnabon 4-pack for breakfast. We drove up to the drive thru menu and squawky speaker at 10:05 and waited. No, "may I take your order" or anything. So I pulled up to the window where someone was preparing to open. When she saw us, she opened the window and said, "Oh, what time is it?" as they were to open at 10:00. I told her it was five minutes after and she took our order. Katie, riding shotgun took the box of rolls and began to cut them apart and dole them out. With the dripping frosting, somehow Cynthia ended up with a wad of cinnamon roll in her bare hand, struggling to keep it there. I had a small piece wrapped in a napkin that I was trying to eat without contaminating the steering wheel while Katie was still cutting up pieces for herself and Lisa. Lisa was the most successful at keeping her hands clean, but the rest of us were wrestling with the rolls. It turned out that the rolls were not warm out of the oven, nor were they fresh. I guess that will teach us not to show up at the crack of ten o'clock to get some breakfast. I drove for an hour to get us to Corsicana where I stopped at Dairy Queen allegedly to change drivers, but it was really so I could get a dip cone and for a potty stop. Then Lisa was good enough to take over the driving. During my pre-hospital trip and stay there, I had had very little sleep and was already getting tired. Lisa was floor boarding the car south. Fortunately, the speed limit for much of the trip between Dallas and Houston had been increased to 75 MPH. We had whizzed past Buc-ees (one in a chain of excessively large road side rest stops…with clean bathrooms) in Madisonville before we ever saw the turn off. We stopped in Huntsville at Margarita's Mexican restaurant for lunch and beat the heavy traffic through downtown Houston before rush hour got any momentum. We stopped at La Quinta, where Katie, Lisa, and the four in the other car would spend the night, then Cynthia and I arrived at brother John's condo where we stayed. We were there for just a couple of hours before meeting everyone for, you guessed it, more Mexican food at the Original Mexican Café on 14th Street. 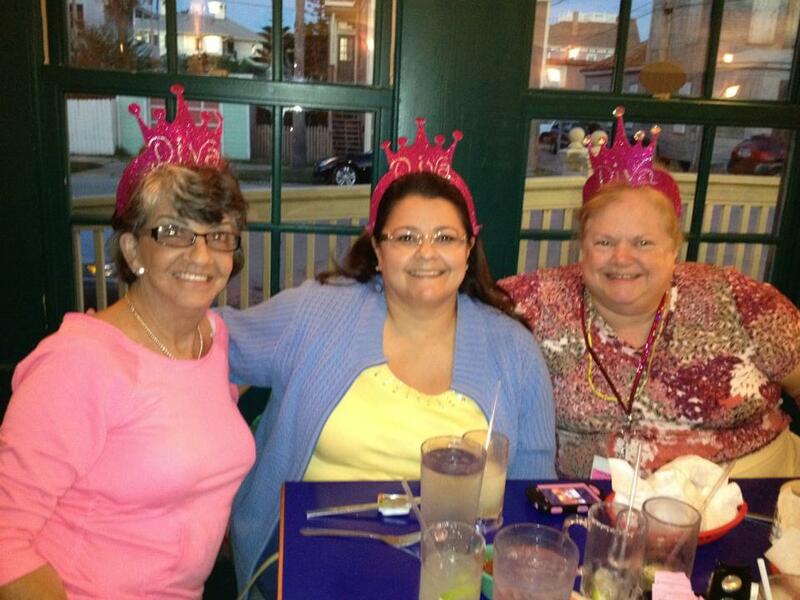 It is the oldest continuously operating restaurant on Galveston Island. I guess Cynthia and I were the only ones who hadn't met everyone else. So, we met Wendi Hart. Lisa rode with us, while Ashly drove the other bunch of four. 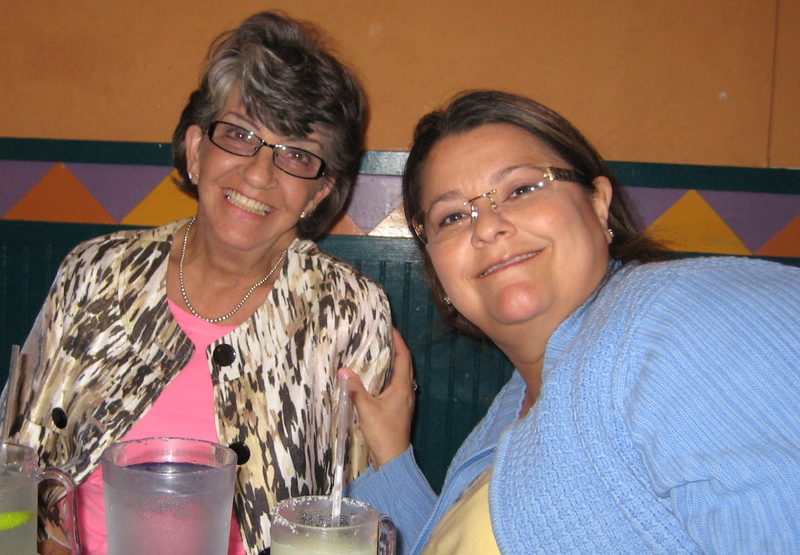 Ashly brought her mother-in-law, Ann and a best friend Denise Condran, who were both a lot of fun. While we were eating, Allen joined the eight of us for a drink. 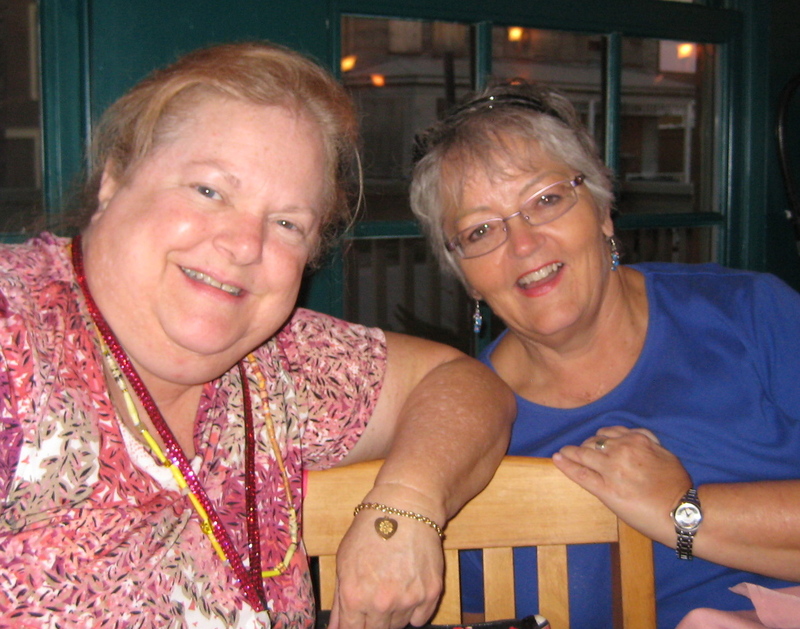 This year, I had six more ladies coming from Harlingen and San Antonio, who I also had not met before. One was Bobby and Barbara Adair's daughter-in-law, so I was anxious to meet the rest of them. Since they were getting a late start driving north from the Valley, they had not been able to join us for dinner. Thursday was our day to board the ship. But, before dropping off our luggage, Cynthia discovered a couple of essentials that she hadn't packed. So we decided to stop at Walgreens before meeting up with Katie and Lisa again. 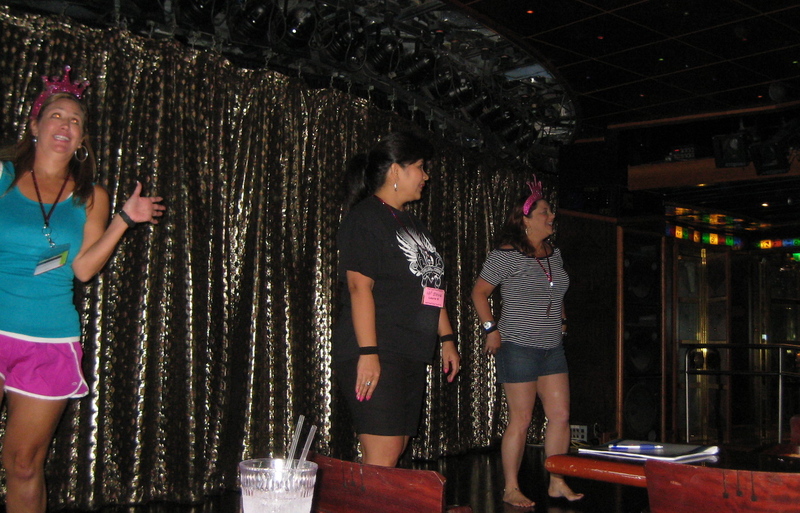 While there, I decided to fill my prescription from the hospital in case I needed it during our cruise. We finally got all of the luggage and the people dropped off. 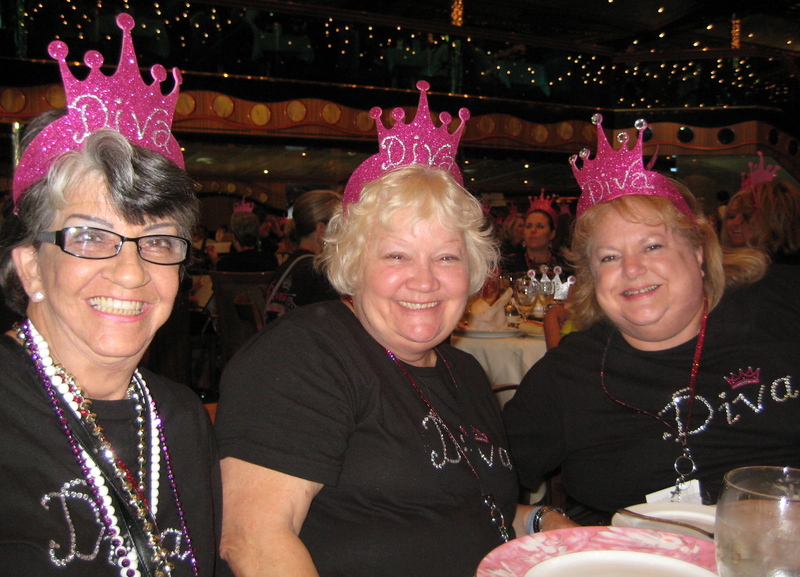 Most of the Divas had purchased the black Diva T-shirt and we were all to board wearing them along with white shorts, capris, or slacks, and our sparkly hot pink Diva crowns. This makes a pretty good impact when there are one hundred twelve ladies boarding at the same time. 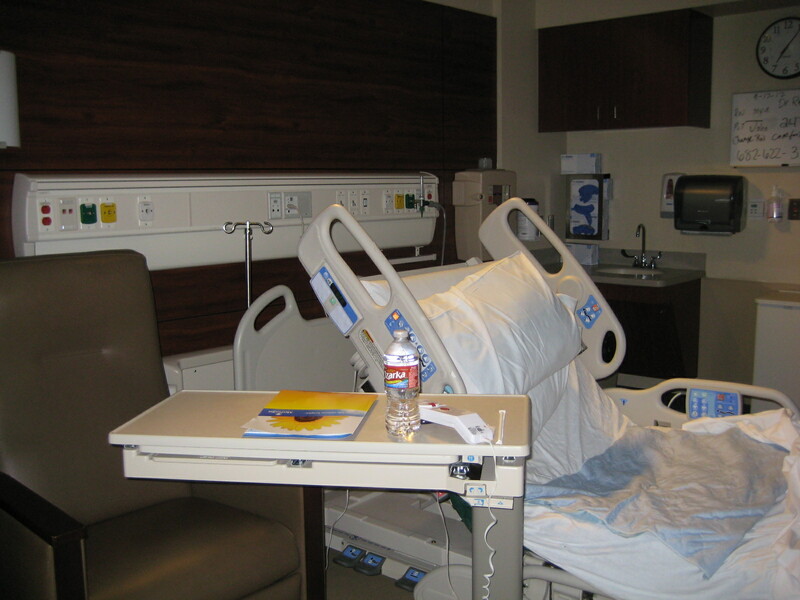 In addition to my recent hospital issues, I am still having severe back pain. The path from the terminal to the ship is a seamlessly unending series of ramps that go back and forth, up hill, with no place to rest. So once I got past the check-in desk, I opted for assistance boarding. The wheel chair ride was great, and of course I tipped my driver. I was dropped off in the lobby of the ship and headed for Deck 9 to try to save some poolside tables, at Sherri's request, for the Divas to gather 'round. 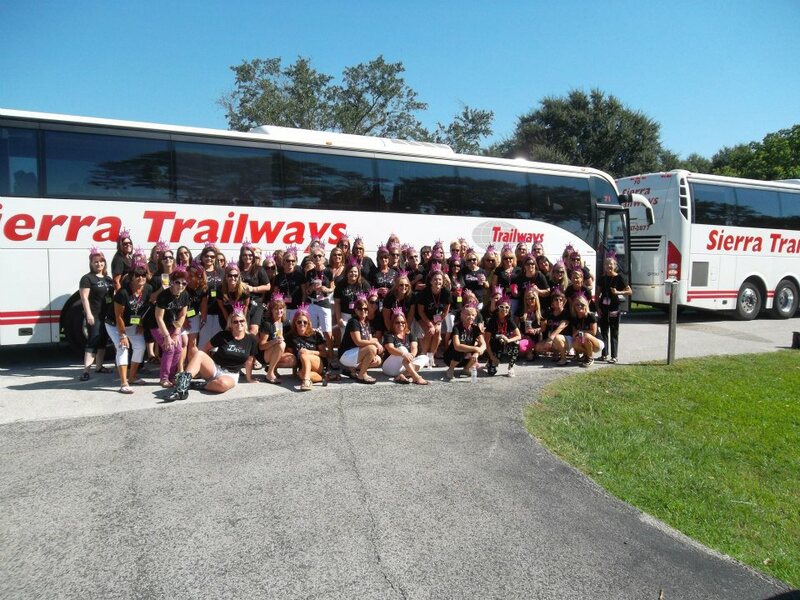 Two busses full of Divas were coming from Sherri's home in Cypress. It took a few hours for them to arrive and check in, so it was almost two hours before anyone showed up to take advantage of the reserved tables. Meanwhile, I hadn't had any breakfast or lunch, so I was starving (figuratively, not literally). I went into the buffet area as soon as someone else arrived. 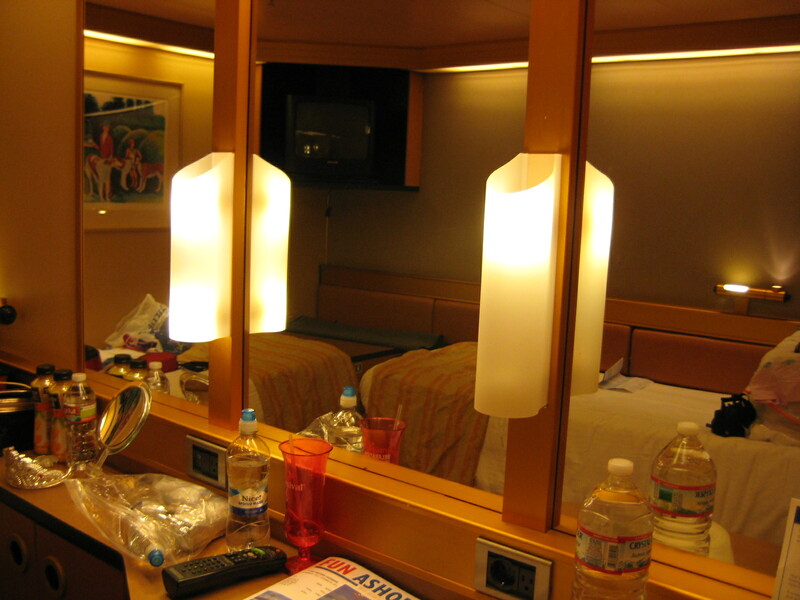 By the time I'd finished lunch, the staterooms were available to occupy. 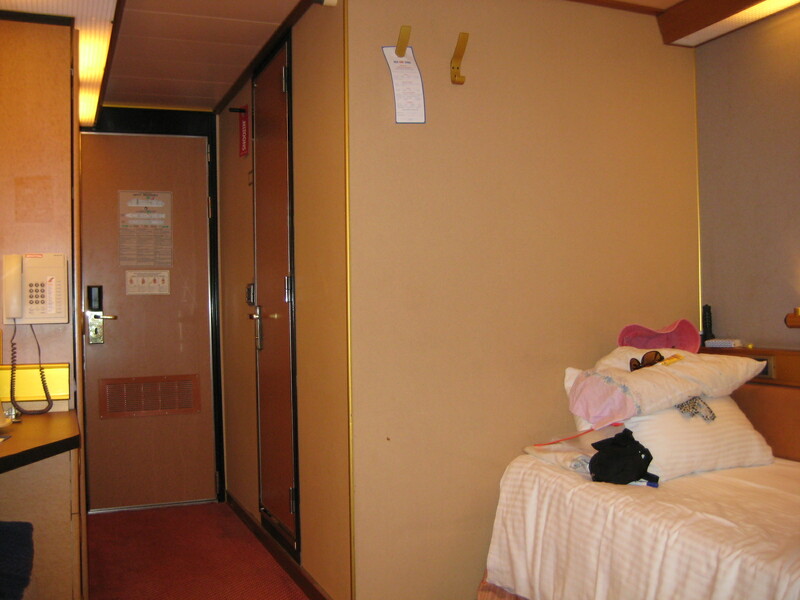 I arrived at Cynthia and my cabin #6373 and found that our luggage had been delivered outside our room, in the hallway. Cynthia and I took some time to rest and unpack before it was time for our emergency drill that Carnival does before leaving the dock. 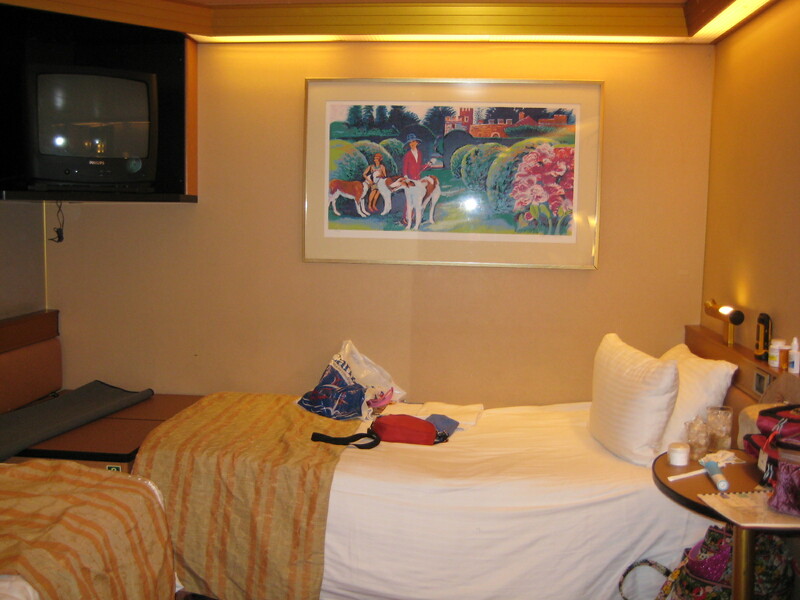 For an inside stateroom, I though ours was surprisingly large. 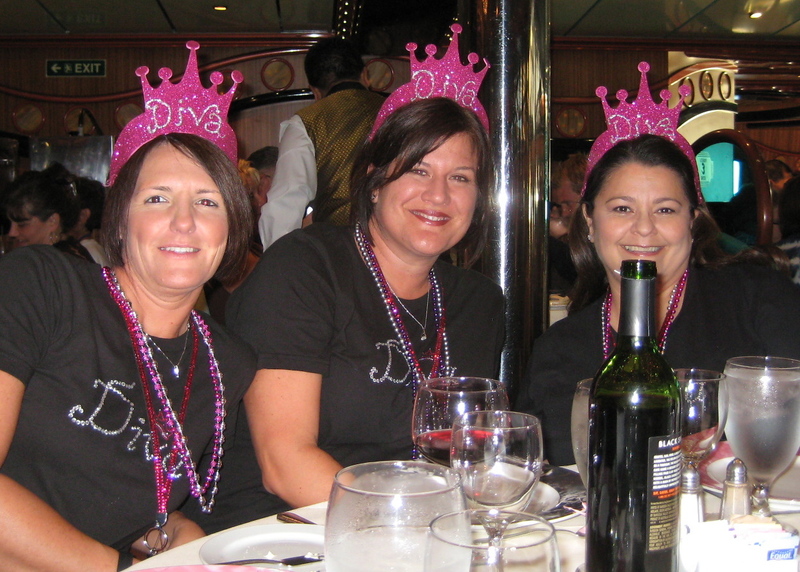 For our first dinner aboard the Carnival Triumph, we all wore our "Diva outfits" when we showed up in our reserved area of the dining room. Each place had a "toe ring" party gift. 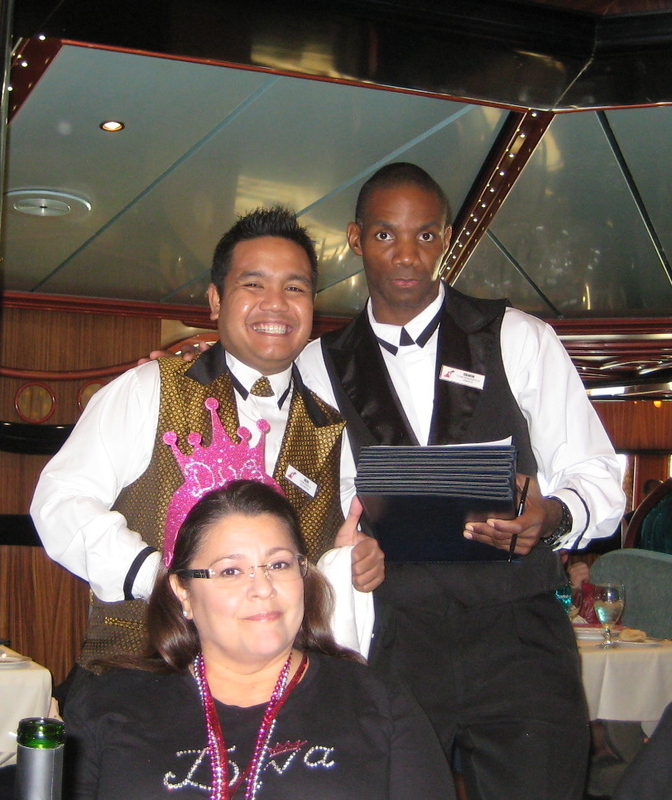 We met our servers, Abrahim and Mere (pronounced Mary.) 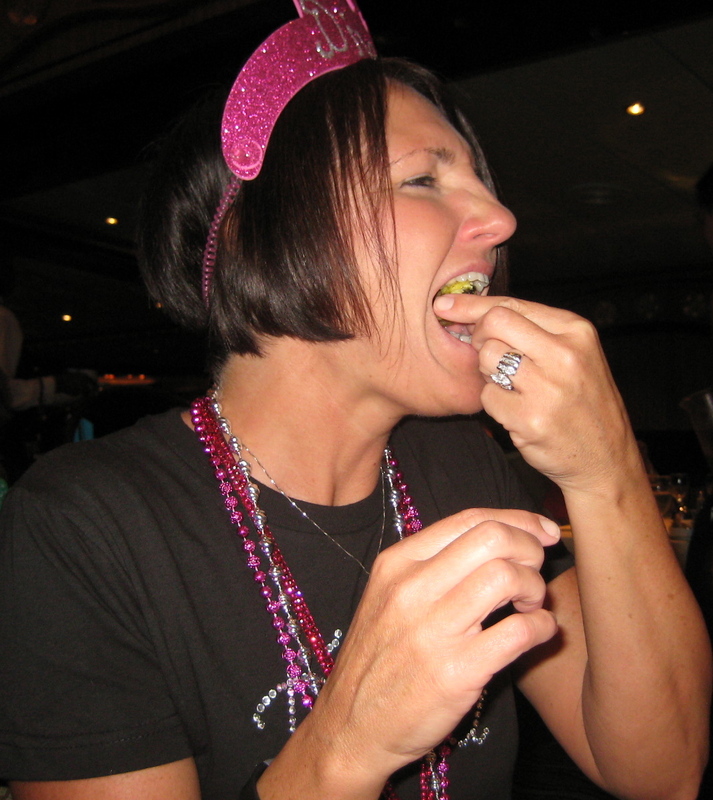 This is also where Lisa met and ate her first escargot. It's amazing how everything tastes like chicken. I'm glad I don't eat chicken. 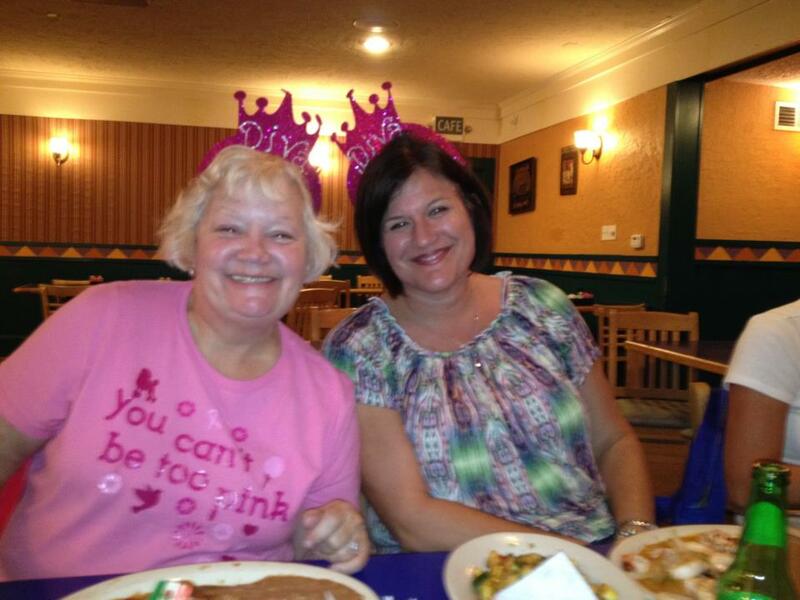 In the dining room is the first time I caught up with Belinda and her friends, mostly from Brownsville so I could give them their hot pink Diva crowns. What a nice bunch of friends she has. After dinner I returned to my room while the others went to party. Party = dance and drink and watch the shows. Feeling like a Sluggo, I decided I must still be recuperating from my hospital meds. I met our room steward, Yasa. 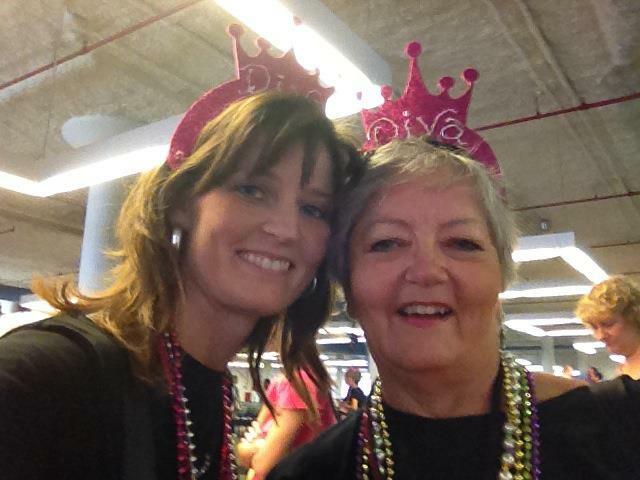 I noticed that a Diva fairy had deposited a magnetic door sign in the shape of a Diva crown.